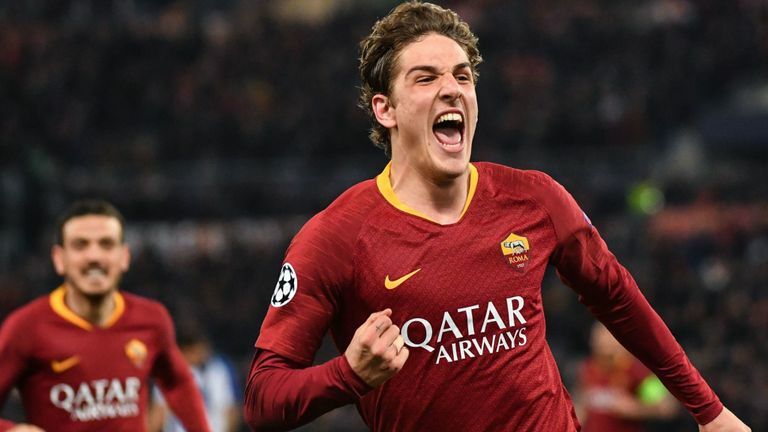 Bavarians enter the battle to sign Roma attacker Nicolo Zaniolo and ready to compete with Arsenal, Chelsea, Milan, Juventus and Real Madrid for the footballer. Niko Kovac wants to improve the front-line, and his primary target is Italy international who has a great campaign and paid attention. James Rodriguez will return to Spain, Thomas Müller is in terrible form, and they need back-up. Croatian coach will do everything to add him in July when the transfer window opens again. Gunners, Blues, Rossoneri, Bianconeri and Los Blancos are also interested in signing him, and there will be a battle for the player. Nicolo joined the Italian club from Inter Milan last summer with a £5m deal. He has a vast potential and can become a world-class attacker if he continuous improvement. In this season, Zaniolo already played 32 matches, scored six goals and made two assists in all tournament. It is an impressive result, and he can improve his consequences with high-class partners. The Italian starlet has contracted with the Giallorossi until 2023, and his release clause is around £40m. His price could increase during this campaign and become much more. The 19-year-old midfielder also played several games in the national team which is already a big success for the footballer. Bavarians have a fantastic result in the Bundesliga as they are leading the table and have the opportunity to win the tournament one more time. German club lost the Champions League second playoff match against Liverpool 1-3 and kicked out from the competition. Bayern Munich already signed Stuttgart player Benjamin Pavard, Atletico Madrid defender Lucas Hernandez and Vancouver Whitecaps attacker Alphonso Davies.